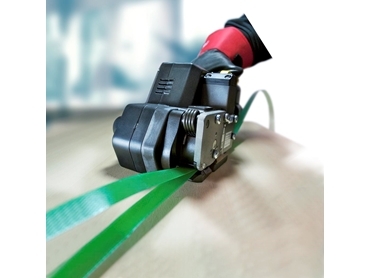 Fromm's P325 is a new polyester (PET) strapping tool. The Fromm P325 can cater for PET strap up to 19mm and is used in the brick, timber and steel industries. Due to its large 14V battery, the P325 is independent of any power supply. This makes it especially useful in mobile strapping applications. Tensioning, sealing and cutting off the strap are accomplished by pushing the respective, ergonomically arranged press levers. To save time, the press levers are also arranged for easy one-handed operation. The strap tensioning and sealing times can be individually adjusted to customise the P325 to different strapping applications. This will ensure perfectly secured packages every time. AWS are the exclusive distributors of the Fromm P325 and have specialised in providing innovative and cost-effective strapping solutions since 1977.